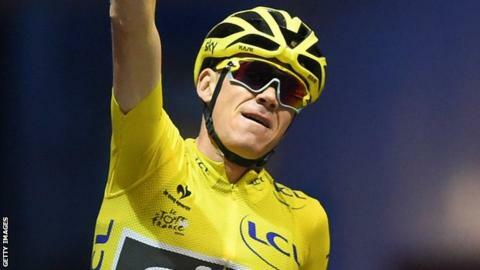 Two-time Tour de France winner Chris Froome will take part in the Vuelta a Espana, the third and final Grand Tour of 2015 which starts later this month. At the end of July the Team Sky rider, 30, became the first Briton to win the Tour twice. In Spain he will attempt to become only the 10th cyclist to win two Grand Tours in one season. He joins Nairo Quintana of Colombia and Italian Vincenzo Nibali in a strong Vuelta field. Quintana finished second behind Froome in Paris this year and Nibali was the Tour champion in 2014. American racer Tejay van Garderen will also compete. The race starts in Puerto Banus on Saturday, 22 August and finishes three weeks later in Madrid on 13 September. A Grand Tour refers to one of the three major European professional cycling stage races - the Tour de France, Giro d'Italia and Vuelta a Espana. The last man to win two in a season was Spaniard Alberto Contador, who won the Giro and Vuelta in 2008. Only French pair Jacques Anquetil and Bernard Hinault have ever won both the Tour and the Vuelta. The latter consists of 21 day-long stages, over a 23-day period that includes two rest days and covers more than 3,000 kilometres.